Forget about fixing your desired schedule to fit that of your future employer. Forget about starting on a date predetermined and desired by someone other than yourself. Forget about doing a job you don’t really want to do, for a wage that you really feel is unfair. Now, think about your career in workamping. This is your ticket to find the perfect job. Your escape from the standard 9-5, into a world of adventure and discovery. With positions, compensation and employers just as flexible as your travels, finding a job that suits all your needs shouldn’t be hard at all. In fact, it’s more likely you’ll have a harder time choosing which to accept and which to postpone until the next year. Before you start scouring the internet or the latest edition of Workamper News for your next position, take a moment to enlighten yourself with a few of these need to know aspects of finding your perfect jobs. Discover the most popular types of workamping employers, compensation packages and workamping positions. 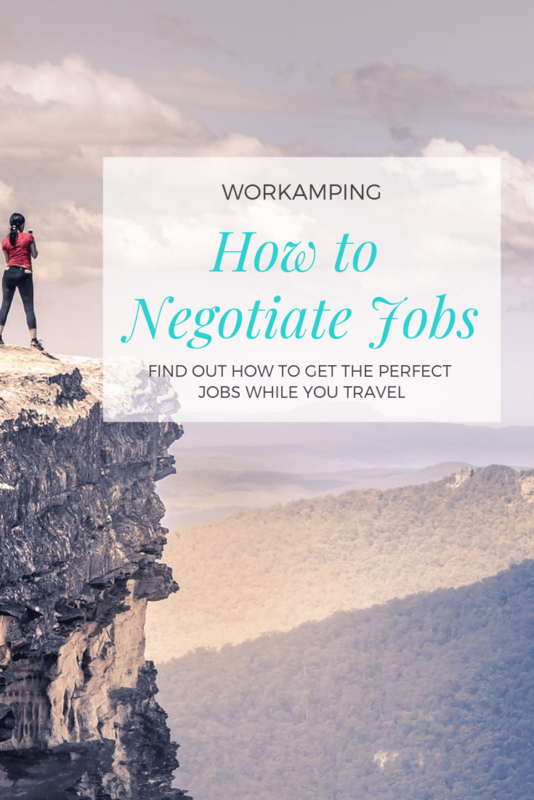 Knowing the types of employers looking and hiring Workampers is a must, for anyone looking for work while traveling full-time. There are several types of workamping employers, and knowing the general idea of each type will allow you to narrow your search when looking for employment. Let’s look at the 4 major groups and discuss the general idea of each. Big business company programs like Camperforce & The Beet Harvest are two of the largest Workamper recruiting programs in the Nation. They advertise year round, to fill hundreds of open seasonal positions inside and outside of their warehouses. Workampers are pushed to their limits and in return make large amounts of cash, in very short amounts of time, that they can pocket for later in the year. Production times and hard physical labor are no secrets to these types of workamping jobs- so be prepared when you accept the offer. Many jobs are offered by private individuals, who own a small company and are looking to keep expenses low and productivity high, by hiring a seasonal worker. Campgrounds, like KOA & Jellystone Parks, are all prime examples of how private owners can offer many workamping jobs for those looking for out of the box employment. Each owner will have their own unique way of running their business and this might work in or out of your favor. Dealing with small town politics isn’t for everyone, and you hopefully won’t find it at every park. But if you can safely navigate the thin ice between what is required and acceptable- working for a private owner will open the floodgates with a steady stream of job opportunities. Several corporations also offer a variety of workamping jobs from season to season. Companies like Bowlin Travel Centers actively hire Workampers to work and live on-site at their Travel Centers in New Mexico & Arizona on both short or long-term positions. Offering benefit packages including perks like a 401K, Vacation Days & Medical Plans are very appealing to the right person. Closer to the natural beauty of the great outdoors, workamping at one of the many State or National parks can offer the ability to see new and exciting parts of the country from an insider’s perspective. Living onsite at Yellowstone National Park would be completely different than a quick a weekend road trip, by offering more time to explore the park and surrounding areas. Staffing companies, as well as onsite staff and websites dedicated to each State or National Park, offer daily job listings for multiple positions and time frames. Employers around the globe are looking for seasonal workers to fill open positions. Looking beyond those who know the meaning of the term ‘Workamper’ will not only open the horizon for employment but also further the education of future employers who could benefit from hiring Workampers for their businesses. Every employer will have their own way of serving up their positions to applicants. One way will work for some, while another will attract the masses. Knowing the different types of compensation, you can expect to be offered, will give you a better idea of which jobs you should even apply to. Also, if you know these 3 main types of compensation, you’ll know how and where to start your negotiations. Working for your site or volunteering is only an option for someone with an additional stream of income. Many companies offer these arrangements in hopes of finding Workampers, who are not relying on them to furnish a paycheck, just beautiful scenery and a few hours a week of busy work. Employers will offer a job in exchange for your site, by stating something similar to this “FHU for 12 hours per week”. Knowing what that means, will make sure you understand the work agreement prior to accepting the job offer. Probably the most desirable workamping agreement, the employer will pay you for all hours worked at a specified rate. An employment ad might say, “FHU provide plus $10.50 per hour. 30hrs per week.” This is a very attractive deal for the Workamper, as all their living expenses would be included, and as a result of such these jobs will typically be the first off the market. Make sure to apply early and put your best foot forward, they’ll have many applicants to consider and you will likely have just one chance to pitch yourself! Instead of accepting the first offer thrown out, why not counter offer with something that suits your needs. Asking for a custom tailored compensation package doesn’t offend most employers. They will likely counter back, giving you a compromise somewhere in the middle. You know where you’ll apply and what you’re really looking to receive, but what jobs tend to be most available? Popular Workamping positions are just a starting point, for your RV travels. Gigs are available all across the map in just about every job category you can think of. But starting with at least the most commonly offered will give you an idea of what to expect and what to look for. Hosting at a campground is probably one of the most well-known Workamping gigs. The idea of living onsite, welcoming fellow campers, answer questions, escorting, and closing the park gates are some basic job functions, that make applying for jobs as a campground host, very attractive. Less strenuous labor requirements, the ability to usually work from your site or close to it, and the opportunity to return year after year make these positions highly sought after and quickly filled. Along with the comforts of working mostly inside the office, with well-stocked shelves and air conditioning, the job of the front desk staff is quite appealing for those who know their way around the computer. Entering reservations, checking out customers on a POS system, while answering questions and the phones are the main responsibilities for this position. Standing on your feet with little movement can be a downside, but based on your property location, this might not be an issue. Many front desk associates have a background in customer service or retail that serves them well when entering and applying for these jobs. But even a newbie to computer reservations can pick up most park software relatively quickly, with the right amount of training and support. As the single most organized person on the campground staff, the Activity Director has to be well equipped with a Plan A, B & C at all times. Responsible for recreation, events, activities and the overall fun factor of the property, you have to know your property, plan accordingly, and make sure each activity or event is structured and staffed to ensure guests enjoy themselves. A typical day can include hours of computer work, researching crafts and creating new themed games, as well as training the recreation staff as to how to properly conduct the activities and then, of course, the act of overseeing the events and throughout the property. This is one of those jobs, that no matter how much you do and how many employees are working together, there will always be something else that pops up. The job of property maintenance is never-ending. From sun to sundown, there are jobs in different areas that will require your attention, some will be more pressing than others, but all will need to be completed asap. Typical duties can range from cleaning fire rings for the next camper to installing electrical in new onsite cabins over the winter. Based on your experience, certifications, and level of comfort and expertise, taking a job in property maintenance can mean a lot of different things for a lot of different people. Hands down the hardest Workamping job on most properties. Housekeeping is one of those love it or leave it positions. If you love what you do and your good at it, then you’ll enjoy it. If you don’t, then just leave it alone. Cleaning cabins, washing laundry, keeping up the bathhouses and even the main buildings like the office and café is hard work. It’s also made even harder by the necessity to continuously redo it throughout the days because the spaces are so heavily used. Working for the retail giant, Amazon.com is a whirlwind type of experience. They filter in groups of Workampers, into a variety of different positions in their fulfillment centers, through the fall season. Expecting a full season commitment, 100% accuracy in addition to the physical requirement of demanding manual labor. Camperforce is a popular choice for many Workampers, as it’s an ‘easy’ way to stack cash for the winter and hold you over until the Spring. Just because the ad said they were looking a maintenance man doesn’t mean that’s what they really needed. So if you’re a woman, who enjoys working outdoors in maintenance, landscaping or escorting, then speak up, the job might be yours if you just ask for it! The reality is workamping jobs come in all shapes and sizes. Just like the adventurous people who apply for them, they’re created to be flexible. They are easily customized to meet the needs of the masses, making them perfect for you, your neighbor and your friend down the road. Knowing the main types, popular compensation packages, and employers will not only make your search run smoother but also allow you to negotiate and tailor each job offer to meet your specific requirements.